The story of Weber and Ducane is a fascinating part of the history of modern Weber gas grills. It was through the purchase of Ducane that Weber was able to develop the Spirit II line of Weber gas grills. 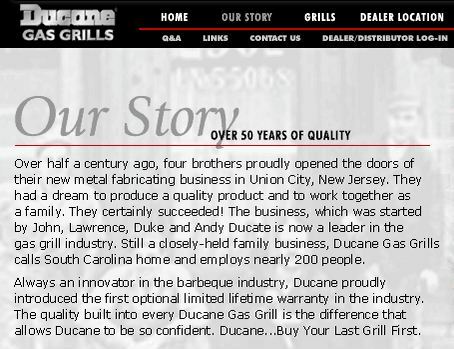 Ducane was founded in 1946 as a heating and air conditioning company and entered the gas grill market in 1975. In 2000 Ducane sold their heating and air conditioning division to Lennox to focus exclusively on their gas grill business. Ducane grills came with a five year warranty that, with a registration fee, could be upgraded to a lifetime warranty. Ducane was a direct competitor to Weber with reported sales of 9 million grills in 2000. In 2001 Ducane completed construction of a brand new $8.3 million manufacturing facility. The facility was partially funded from the sale of the heating and air conditioning division with the remainder financed by debt. This construction debt was taken on right when the US economy was starting to go into recession. In 2003 three national distributers for Ducane were forced into liquidation and were unable to pay millions of dollars of invoices owed to Ducane. In 2004 Weber purchased Ducane’s assets out of bankruptcy for $13.6 million. An interesting note is that Weber only purchased Ducane’s assets and was not responsible for Ducane’s liabilities. As a result, all lifetime warranties purchased for Ducane grills are now worthless. There are a lot of people out there who now have to buy Ducane grill parts even though they paid for a lifetime warranty. What Weber did after they purchased Ducane was very interesting. Weber kept the Ducane brand in the market but never took action to associate the Weber brand with the Ducane brand. Instead Weber used the Ducane line of grills to compete in a lucrative market slot, low end gas grills. At the time Weber purchased Ducane all Weber gas grills cost between $700 and $1200. There were many consumers who did not want to spend that much money on a grill. There were many consumers who wanted grills in the $200-$400 price range and Weber did not have a product for them. The high cost of the Weber gas grills was driven by the use of high quality components and labor costs in the United States. Weber reduced the cost of the Ducane grills by outsourcing the construction to China and using lower grade materials. By 2006 Weber had been able to reduce the cost of a Ducane gas grill by 50% and was selling them for ~$400 at Home Depot. By keeping the Weber and Ducane brands completely separate Weber was able to experiment with large scale outsourcing to China without any risk to the Weber brand. Once Weber was comfortable with Chinese manufacturing operations it began marketing Chinese made Weber gas grills under the Spirit line. The Weber Spirit grills, available for natural gas or propane, now effectively compete in the $400 grill market and Weber has discontinued marketing any grills under the Ducane brand. Buying a bankrupt brand, Ducane, to experiment with outsourcing was a brilliant idea by Weber. If you would like to read more on the history of Ducane then you can check out the sources I used for writing this article.